All-in-one jacket Keep yourself and your baby comfy and cozy with the Boba Hoodie, which can be pulled over you, your baby and your carrier in one fell swoop. $55. Wet bag Don't want to carry a full diaper bag? Try a smaller waterproof bag that can snap on to your carrier or wrist—perfect for carrying an extra diaper (even a wet one) or a change of clothes. Snuggy Baby has several cute yet functional styles. $19 to $45. Support Belt through your carrier's belt to give you an extra boost. $25. Rain cover Protect your baby from the elements with a snap-on rain cover. Infantino's Hoodie Rain fits most infant carriers and even features a "cuddle pocket" to keep your hands warm and dry. $17. Weighing in at a mere 8 ounces and compact enough to be rolled into the size of a water bottle, the Bitybean is a gear-weary parent's dream. Functional enough to be used as a front or back carrier, it's also í¼ber-easy to adjust to fit multiple users. 8 to 40 pounds. $55. The Hotslings Adjustable Pouch Sling is the epitome of ease: Just slip it over your head, snuggle your baby inside and go. It's also easily adjustable to different users (and your own body as it changes postpartum), thanks to two strategically placed buckles. The SUPPORI Sling is small enough to fit in the palm of your hand so it's easily stowed in your diaper bag. 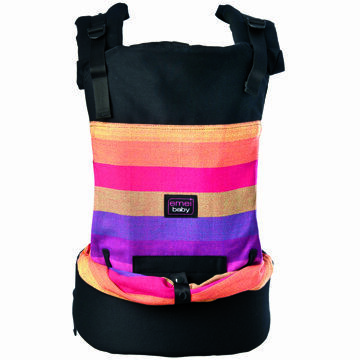 Available in 15 colors, the compact carrier features a fabric that stretches as your baby grows. For babies who can sit up unassisted to 28 pounds. $55. It can be tough to find a carrier that comfortably fits you, your partner and your baby, but the Beco Soleil Baby Carrier eliminates that issue. Featuring dualadjustable shoulder straps, the carrier is easily customizable to fit different wearers. 7 to 45 pounds. $130. Attention, parents: The iconic baby carrier just got better. Thanks to a sturdy waist belt that shifts your child's weight away from your shoulders and to your hips, Baby Bjí–rn's Comfort Carrier lets you carry your child all the way through toddlerhood. 13 to 31 pounds. $170. 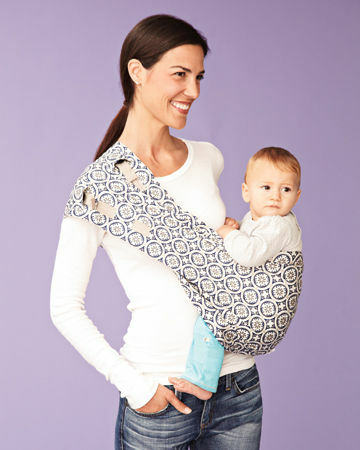 The Moby GO from MobyWrap will keep you and your older baby comfy. Wide shoulder straps in a cross-back design help distribute weight more evenly, while handy side buckles allow for the perfect fit. And the ergonomic seat design keeps her legs straddling your body rather than dangling willy-nilly. 15 to 45 pounds. $80. Beyond using plain old common sense, there are a few steps you should take to keep your baby safe in whatever type of carrier you choose to use. 1. Read up: Carefully review the manufacturer's instructions before using any carrier. 2. 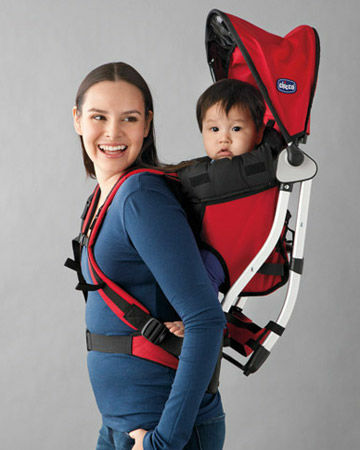 Be selective: Only use a carrier that is appropriate for your baby's height and weight. 3. Don't cut corners: Use all provided snaps, buckles and the like and fasten them securely. 4. Chin up: Make sure your baby's face isn't covered and is visible at all times, and that her chin isn't curled toward her chest. 5. Change position: If you nurse your baby in a carrier, change her position after feeding so her head is facing up and is clear of the carrier and your body. 6. Keep it straight: Make sure your baby's back is straight and supported. 7. Give a hand: Many carriers tout that they are hands-free, but keep a firm grasp on your baby whenever possible. At just 8.2 pounds, the Chicco Smart Support Backpack, $100, makes for comfortable neighborhood walks or mountain treks. A weather shield protects your baby from the elements, while the free-standing design makes loading and unloading him easier. From sitting up to 40 pounds. With its ergonomic waist belt and adjustable back support, the Baby Bjí¶rn Baby Carrier Miracle, $184, allows you to distribute your baby's weight between your hips, waist and shoulders for greater comfort and less stress. The adjustable design grows with your child. 8 pounds and 21 inches to 26 pounds. The Munchkin Jelly Bean Reversible Sling, $25, couldn't be easier to use: Just slip it on, place your baby inside and you're ready to go—no buckles or rings to fuss with, no adjustments necessary. It also allows for easy, discreet nursing. Available in three styles, all with reversible fabrics. 18 to 35 pounds. 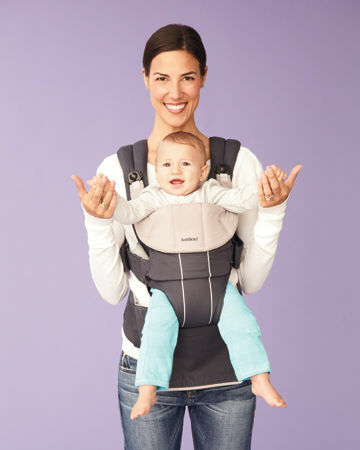 The Lí­llébaby Nordic Carrier, $80, gets rave reviews for good reason: It's comfortable and has six carrying positions: front-facing in with a narrow or wide seat, front-facing out, hip, back and cradle carry with an infant insert ($20, sold separately) to take you from infancy through toddlerhood. 7 to 42 pounds. 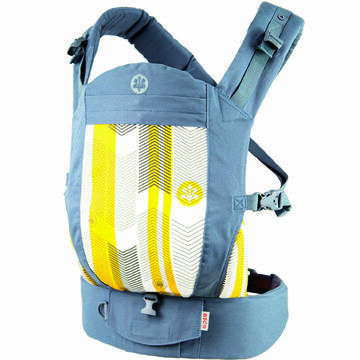 Produced in collaboration with designer Jennifer DeLonge, the Snugli Front and Back Baby Carrier, $60, features a large cargo pocket for on-the-go storage. Plus, three carrying positions—on your front, facing in or out, or on your back—let you choose what's best for you. 7 to 32 pounds. Made in the U.S. and featuring eco-friendly GOTS-certified and Oeko-Tex Standard 100 fabrics, the Beco Gemini, $130, makes supporting the economy and the environment easy. You'll also feel good when you wear it, thanks to its smart design that distributes the baby's weight between your shoulders and hips, reducing back and neck strain. 7 to 35 pounds. â– If your child was born prematurely or with a low birth weight, or if you have twins or a baby with health concerns, check with your pediatrician before using a sling. â– Make sure your baby's face is not covered and is visible at all times. â– If you nurse your baby in a sling, change his position after feeding so that he is facing outward, chin up and clear of the fabric. â– Check your baby often when using any sling or carrier. 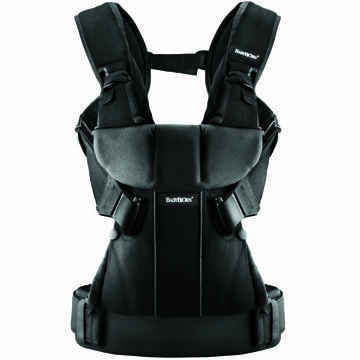 Made of 100 percent cotton, the elastic fabric of the CYBEX u.GO allows for six different carrying styles. Position your newborn facing in (and close to your heart), or place your baby (6 months and older) in the foward-sitting position so he can see the road ahead. Newborn to 40 pounds.